A Victorian period 3 pc. bedroom set includes a queen size bed plus a chest or dresser with mirror and also a commode or nightstand, both with marble tops. Solid walnut with burl panels, the restored lustrous finish is in excellent condition on this American made antique furniture. Delicate carved detailing and matched burl panels are beautiful. The bed has been expertly adapted to fit a standard modern queen size mattress and spring unit, extending the original side rails. The demonstrator set in photos is 18" thick together, wood support slats underneath are included. 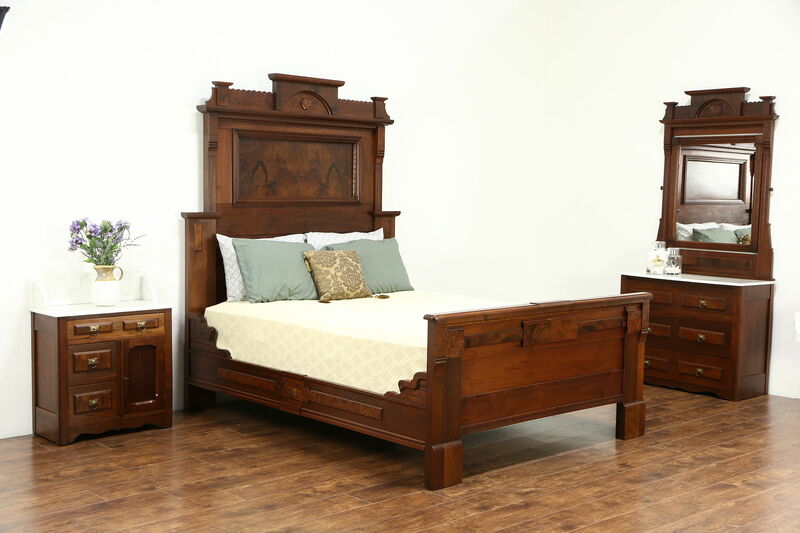 Measurements are 68" wide, 86" long, the headboard is 81" tall and the footboard is 32" high. Marble tops on the two chests are original and have been polished and sealed to resist stains. Drawers have the "pin and cove" dovetail joints characteristic of the era. Ring pulls are original, the door has a working lock and key. The chest swivel mirror is a replacement. Size is 38 1/2" wide, 18" deep and 82" tall. The small chest is 27 1/2" wide, 14" deep and 35" tall.